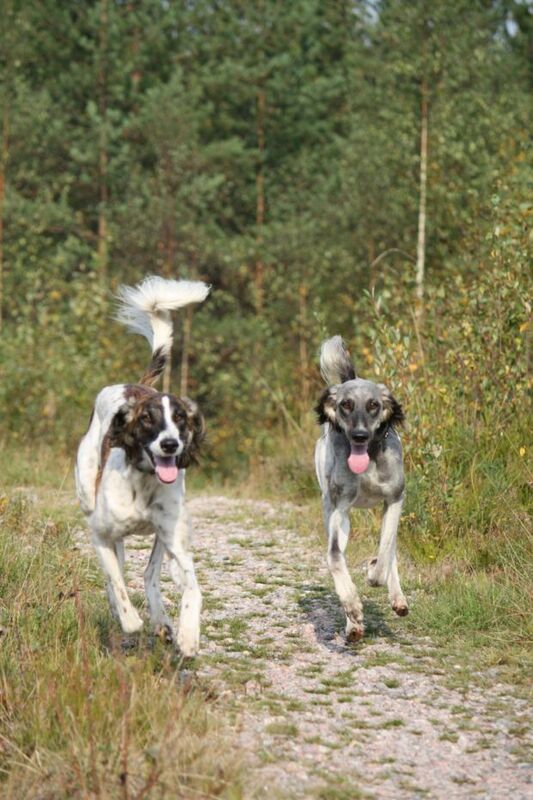 Yuzak salukis are bred for mens sana in corpore sano, genetic diversity and speed endurance. Two first principles are of course essential in breeding any breed. The DLA studies show over 70 % of Finnish Salukis having haplotype 02001 00401 01303. I don´t do combinations where is a danger of getting this type homotsygote. Speed endurance is a Saluki thing, unique for the breed and worth cherishing. Emphasis on both words that can be found in the Saluki standard. Racing against the ruthless clock provides me the best available method of assessing this quality. My experience with Iranian Salukis is that they fill these expectations well. Plus have looks that please my eye. Yuzak Salukis are combinations of western and mainly Iranian bloodlines. All colours are permissible and thus welcomed at Yuzak´s. I believe form follows function and leads to a balanced conformation of an arid land hunter. Dog shows are not my hobby nowadays, but I recommend taking an opinion of breeder judge at least once. Saluki is a dog after all and must have temperament suitable for every day life. A good pet makes a good companion for dog sports, if the owner wants so.